Church president Manfred Rekowski visits Sea-Watch. “These helpers save the lives of people in distress at sea. 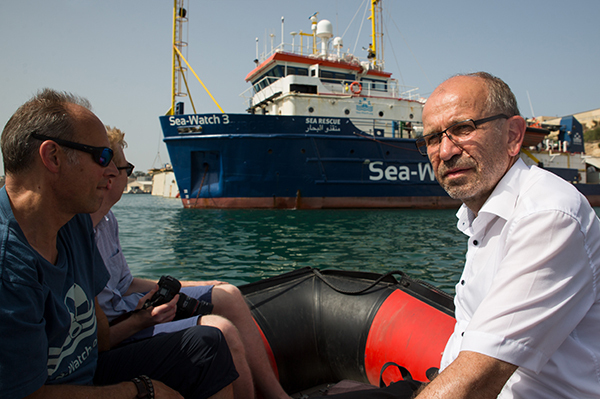 The charge that they work hand in glove with smugglers makes them look like criminals and denigrates their valuable service,” said Manfred Rekowski, after a meeting with crew members of Sea Watch 3 in Malta. The EKD is involved in financing the Sea Watch organisation. The charge of aiding and abetting smugglers was also absurd, he added, because the rescuers were complying with international law of the sea and all their missions were coordinated with the competent state rescue authority. Rekowski: “It is an unconditional obligation to rescue those in distress at sea, independently of whether they got into trouble voluntarily or by accident." Until recently civilian sea rescue organisations have been publicly praised for their humanitarian missions, said Rekowski. The volunteers working on ships like Sea Watch 3 were concerned that the EU’s values were now beginning to shake. “The rescuers are not the reason why people flee over the Mediterranean, but a reaction to a development that is also the result of a misguided refugee policy,” said Präses Rekowski during his visit on board Sea Watch. And even though the political mood has changed, the EKD still considers engagement for human life to be imperative. “No one should have to drown,” Rekowski asserted. Meanwhile, the Sea Watch organisation reports that every seventh person who attempts to cross to Europe loses their life – far more than in previous years. In June 2018, no rescue ships were allowed to set sail from Malta and 629 refugees are known to have been drowned, nearly as many as in the first five months of 2018 together (663). In July 2018 at least 233 people have already drowned. That makes well over 1500 deaths to date in 2018. The estimated numbers are much higher. The Facebook page of the EKD and the Facebook page of the Evangelical Church in the Rhineland are reporting live andchurch president Rekowski is posting reports of his trip on his blog. All channels plus photos, reports and videos are linked or accessible at ekir.de/malta.